Full set of 56 cards (65 x 65mm), including three blank cards, on five sheets, ready to print and cut out. *Both colour and black & white sets included. For durability, print onto heavy paper or laminate. All you need to know to get started using the cards in a variety of settings. Great for larger groups or for recording choices. All the values listed on a single sheet with columns for detailed sorting. The most economical way to achieve detailed sorting in a large group. For the Organisational Values activity and the School Values, this sheet lists all 56 values with a scoring and notes column. For the Teacher Values activity, and with the potential for use in other settings, this sheet lists all 56 values alongside an ‘impacts’ column to write in. If you have purchased The Values Cards you can access the downloads free by clicking on the above “Add to cart” button, proceeding to checkout and using your 6 digit special passkey in the “Have a coupon?” prompt at the top of the checkout page. 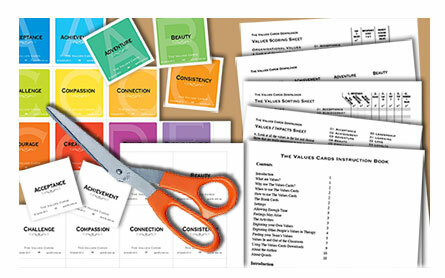 Please note that The Values Cards Downloads are copyright to Qcards’ contributors. The work may be printed for personal, therapeutic or educational use only. No part of the work may be further transmitted in any form or by any means, electronic, mechanical, photocopying, recording or otherwise, without the prior written permission of the publisher.